[The verses reproduced below are the successor to last year's Christmas poem, and to Kendrick Smithyman's rather more worthy effort in 2008. 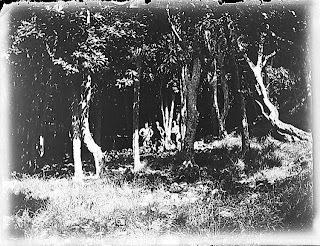 One summer in the late seventies Bruce Hayward tramped methodically over virtually every acre of West Auckland's Waitakere Ranges, discovering and recording archaeological phenomena like cave shelters, middens, burnt-out Victorian farmhouses, burst kauri dams, World War Two Home Guard trails, and an artifical grotto built to house a statuette of the Virgin Mary. Somewhere in the mass of notes which accompanied his maps and grid references, Hayward stated that he had, despite 'extensive searches', failed to locate dendroglyphs on any of the Waitakeres' millions of trees. Hayward's lack of success should not have come as a surprise. The Chatham Islands are famous for the dendroglyphs created by their tchakat henu, the Moriori, but few tree carvings have been located in other parts of New Zealand. A dendroglyph is supposed to have existed near Patea a century ago, and a few examples persist on the shores of Lake Pencarrow, near the bleak south head of Wellington harbour, but trees in other places seem to have been untouched by carvers. In his wonderful study of the Moriori carvings, Rhys Richards suggests that there is a qualitative difference between the dendroglyphs of the Chathams and the rarer, cruder examples in Te Ika a Maui, and suggests that the latter are hardly worth acknowledging. Despite Bruce Hayward's fruitless search out west, and the paucity of dendroglyphs in the North Island as a whole, I often feel compelled to inspect the trunks of the karaka trees I encounter in the bush, in case they exhibit the fluidly beautiful markings found on their counterparts on the Chathams. I'll disrupt a relaxed Sunday afternoon walk with friends by excusing myself from the track, charging off through underfoliage to a distant circle of karaka, and flitting breathlessly from tree to tree. I'll return to the track to report the failure of my mission, and to take an extended ribbing. I think the dendroglyphs of the Chathams fascinate me for the same reason as archaic Maori carvings like the famous Kaitaia lintelpiece displayed at the Auckland museum. With their relative lack of ostentation, their lack of classical Maori motifs like the hei tiki, and their use of ancient motifs like the hocker pose, the tree carvings very obviously hark back to the pan-Eastern Polynesian culture which existed fifteen hundred years ago in places as far apart as the Cooks, the Austral Islands, Pitcairn, and Rapa Nui. Perhaps they hark back even further, to the Polynesian 'homeland region' which included Tonga and Samoa. Rhys Richards argues that the Moriori people lacked suitable materials with which to build proper meeting houses, and instead used the trunks of kopi (that is, karaka) trees as pou on which to carve ancestors, culture heroes and deities. Looking at these images, Moriori were transported deep into the Polynesian past. Is it too romantic, or too presumptuous, to say that, looking at reproductions of the same extraordinary images today, we too can be transported imaginatively? I spent Christmas with family, in a house in the foothills of the Waitakeres, close to the secret jungle warfare training base where Kendrick Smithyman spent some unhappy weeks in 1943 and '44. An intermittently noisy creek ran close to the house, along the bottom of a steep ridge; I managed to get away from the turkey and the booze long enough make an expedition across the water, into a zone which combined scruffily regenerating native bush with plantations of doomed pine. I didn't find any dendroglyphs, but I did spot a midden not far from the creek, and I did later have the archaeologically-incorrect dream which this poem describes. like a bored stud bull. the trunks have been cut. as the light turns grey with age. Merry Christmas Scott. Great post that was fascinating. I passed the Omeru Reserve yesterday and I thought of Ted standing there on the road in that image you posted. It's a shame Hayward never found those dendroglyphs in the Waitakeres. Ian Barber gave an interesting paper at this year's NZAA conference on recent work on the Rekohu dendroglyphs, including the laser scanning thereof and some new thoughts on the meaning of the shell "midden" found around the carvings. The upshot of the latter is that the so-called midden is not food refuse but mulch placed there to keep the sacred groves free from weeds. At least I think that was the upshot, I arrived late and hangover...Great conference; who knew Westport could be so much fun! I wouldn't need any excuse to go to Westport: it's one of the spots in New Zealand I'd most like to visit for the first time. And what a great idea to hold an academic/scholarly conference a little off the beaten track! I'd be fascinated to get a report on proceedings, Jono. Did you give a paper? Barber et al are apparently racing against time to preserve images of all the Moriori dendroglyphs, as beetles and the wind take their toll. It's fascinating to hear his discovery about the function of the midden. I suppose the apparent evidence that food was eaten near the carvings was always puzzling, given the belief of most (all?) researchers that the carvings had a ceremonial/sacred function, and the taboos around food in Polynesian society? I'm Australian and what Ponting did was an embarassment to himself, the Australian team, and cricket in general. The DRS showed him up for being the prat he was in this instance. I only hope he has the decency to apologise for his disgraceful outburst. In past times some (but definitely not all) the criticism of the Australian team has been unjustified, but in this instance the critics are spot on. A really poor example to set the sporting public - way to go Ricky! PS It was a shame to see such a great player losing the plot so completely. It was clear that Pietersen did not get an edge and even after Aleem Dar (and Pietersen, for that matter) pointed out that the hot spot mark was nowhere near where the ball passed the bat, Ponting persisted with his protests. I do not believe Ponting is a cheat so he clearly had the wrong end of the stick, but that really cannot excuse such an open display of dissent and disrespect. I fear that his days as a cricketer are numbered and his behaviour shows more than a hint of raging at the dying light. Pitcairn settled 1500 years ago? Did the Bountry get there 1500 years ago???? Sadly Scott I won't be down the old haunt this week. Next I am going down I'll drop you a line definitely. KKK is still a great place. I had a few mates out there myself once. All have moved on. Hope to catch up soon! What a magnificent poem, Maps! It puts Robert Graves "Old Gods" to shame. To say so much, with so few words, is a great gift. Thanks for your very kind words Chris. 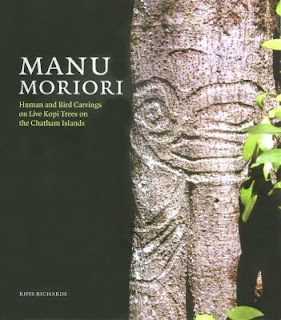 I'd love to hear more about carved trees in the South Island, Keri. I got excited and did a google search when I read your comment last night, but came up empty-handed! Perhaps the locations of these taoka are kept secret, though? It occurred to me that the rock paintings from places like Weka Pass have some stylistic similarities to the dendroglyphs, and to archaic carving in general. Chris is right Scott. You have certainly moved from the SALT days!! And you have worked out a way of a very strong, but still not too direct, language. Ad there are great images and imaginative phrases. The poem works brilliantly. I saw something about Dendroglyphs - I think it was in a book by (the late) Dr Neich I had from the library. Interesting post Maps, and great poem. I didn't go to conference this year but from what Jono says it sounded great. I'm still looking for those dendroglyphs in the Waitaks - one day you never know - but there are not thnat many karaka trees there and all are associated with preEuropean Maori sites. What a strange poem, where did you get it? is the most stunning stuff! I've ever seen.